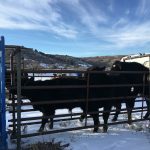 The two weeks over Christmas and New Year are sure busy on the 3T Ranch. We scramble last minute like everybody else to get the last Christmas presents, get few more things from the grocery store, cook a delicious meal or two, "OD" on the Christmas cookies, enjoy our awesome presents and watch plenty of College Football Bowl games. This year, we have also celebrated Peanut's 1st birthday. We threw a big ladybug bash for her and her little friends. She was our surprise Christmas baby last year! OK.. I'm getting to the point of this post! 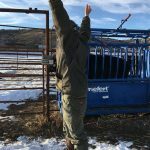 But, there is a "little" bit more for us to do..
No matter the season, weather or how tired we are, we still have to tend to our animals, everyday, twice a day! 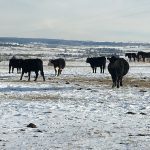 It has been cold, snowy and just not nice, so we have been postponing the weaning of our calves. Our animals do best with minimum stress, so we try to work them in the most gentle manner. 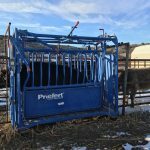 Some of our calves are reaching the point of 800 lbs and such a "big baby" doesn't need to be nursing anymore. 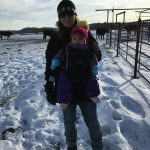 As all of us moms know, nursing takes a lot of calories and we needed to make sure that mama cows are gaining good weight over the wintertime to prepare for the birth of their new babies in the springtime. 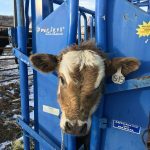 Some of the cows are starting to wean on their own as they mostly eat grass, hay in the winter time, but some of them still didn't want to give up their tasty milky snacks. (Peanut.. hint, hint.. Neither does she want to give up her tasty milky snack)! The sun finally started to shine and we've decided that it was a good day to wean the calves. 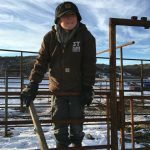 The cowboys patiently waited over a couple of hours to separate the calves from the cows as they came one by one into the corrals to water. Much easier to separate them in a peaceful manner then herd everybody in the same spot and then separate them. Their is plenty of times when we need to herd the older cows, but we needed to be gentle with these "big babies". 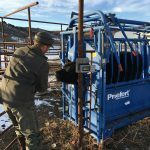 Every calf went through his or her checkup. 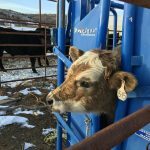 What is a calf checkup? 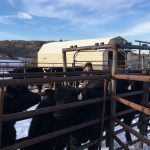 We check their coats, all of them get their deworming solution, pinch them with a needle to deliver their vaccines and everybody gets a tasty probiotic to help their guts adjust to their new only grass diet. 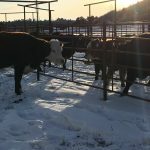 As you can see from the picture below, the cowboss was very happy with the weight of the calves, 800 lbs calf is a stellar achievement not just for any mama cow.It pays off to do things the right way, without hormones or antibiotics, we can still produce some fine animals! As you can see, working cows is a family production, everybody contributes. 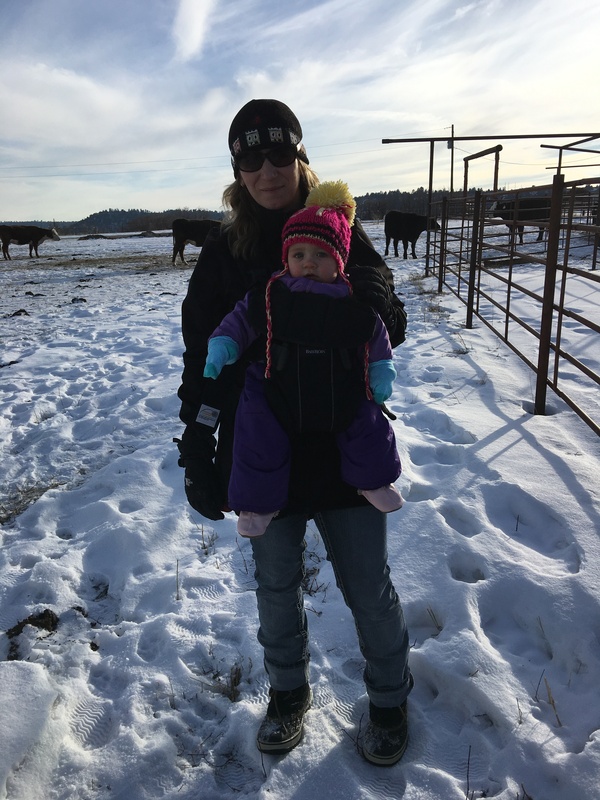 Well, Peanut and I were mostly just for the "looks" this year, but pretty soon our small cowgirl will start her own training.. Well, she already did.. Grammy and Papa got her a cow rocker that she loves and rides all the time. 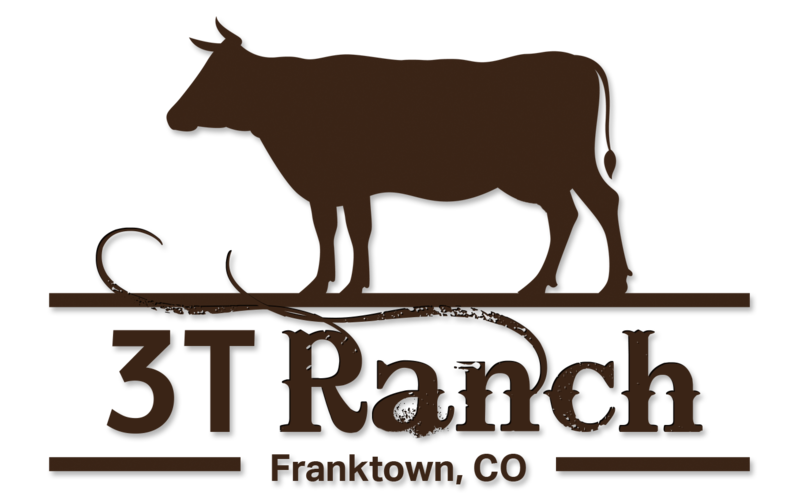 I'm always trying to come up with new recipes to add to our "3T Ranch Food Rotation". The new item has to be approved by my cowboys before it can make it to this prestige list! Trust me, when I say my guys love my cooking, but they are also picky on what they add to our list. I got a shrimp dip recipe from my best friend Carrie many years ago that has been our staple for holidays and family celebrations. I thought that maybe I can tweak it and make it a little bit more festive to serve to my family as we ring the New Year. My practice run has turned out even better than I expected! 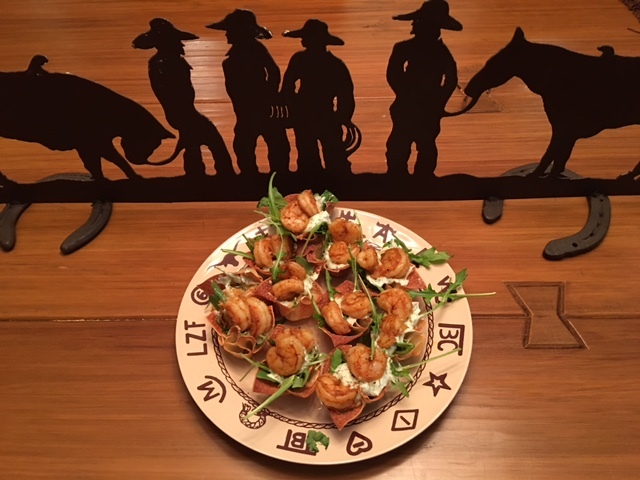 The shrimp cups didn't last very long. Easy, festive and delicious.. you should give it a try! In a bowl combine softened cream cheese, scallions, dill, salt and pepper. Use electric mixer to combine all ingredients for nice smooth texture. Add one tablespoon of milk at a time to make the dip nice and smooth, but don't make it too runny! Pour olive oil into a skillet and turn it to medium heat. Throw in your shrimp along with the seasoning. I have used the Wildtree Spicy Carne Asada as I had some left from one of their parties, but you can certainly make your mix with chili powder, cumin and garlic powder. Cook until pink with a nice crust. (Note: What makes a good crust? Dry your uncooked shrimp in paper towels, so you don't steam your shrimp instead).